The aim of the national food programme of the government is to promote indigenous food production in the country. This is a concept of the President. Local food production would be expedited under this, State Agriculture Minister Wasantha Aluvihare said. 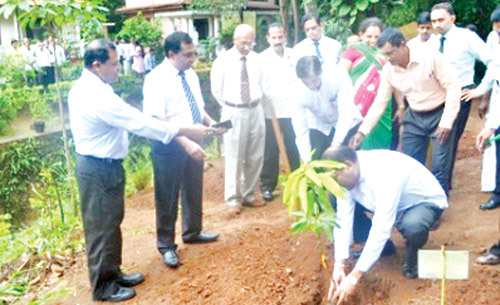 He said so participating in a cultivation program at the Matale Divisional Secretariat. He also planted a mango sapling at the premises. The minister added that all government employees should extend their support to achieve this target. "It is a national mission. The government intends to implement various programmes to educate the people in this regard," he added. "At the moment, we import food products on a large scale spending a large sum of money. This can be stopped. We must strive to cultivate all food crops here. Then, we can save our foreign exchange. The government has decided to halt the import of food items by 2018," the minister added. Matale District Secretary Neil de Alwis, Matale Divisional Secretary K. P. C. Maduwanthi and Divisional Agriculture Director N. Ekanayaka also spoke.